14th May 2009. Mega Sale with Explore Australia Titles, Welcome New Business Members, Last Call for Plot files, and a New Trek - Fitzgerald River National Park. 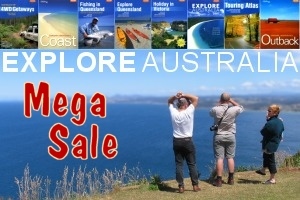 On the ExplorOz Shop, you'll find a mega sale on Explore Australia titles with prices slashed across 61 products. The full range of Explore Australia books is substantially reduced by 20%, and ExplorOz Australiamaps are reduced by 15%, so there is no better time to get yourself a great buy. We are also pleased to advise that the popular Camping Guide to the NT, published by Boiling Billy, is finally back in print and we have plenty of stock ready for those that have been waiting for this book to become available once again. A reminder that one of the best ways to get, or renew, ExplorOzMembership, is to place a shop order that qualifies for free Membership or Membership Renewal. Simply buy $150* worth of products to get FREE Personal Membership added to your cart automatically, or $75* worth of products within one month of your membership expiring to get a free renewal. It's that easy - and of course, you'll get all benefits of Membership for a full 12 months. *This offer excludes award exempt items. The outback travel season is underway but for those that haven't left on a trip yet we take this opportunity to remind you to check the status of your First Aid Kit. We also suggest that you don't underestimate the importance of getting your Desert Parks Pass as early as possible as it contains some great planning information. As mentioned in our last newsletter, we now stock a great range of practical and usefulcamping accessories, and the ExplorOz Sandflag comes as a complete kit with telescopic pole, bracket and flag and takes the hassle out of solving how to rig up this very necessary safety gear if you're heading off into dune areas. For further information on any of the Business Members listed below, you can click the links shown to view the profile pages that they have prepared on ExplorOz or search the Directory. With only a handful of ExplorOz trek notes left to convert to the new format, we desperately need good plot files. To enable us to move forward, we have compiled a list of trek notes that need them - so if you have one for any of these treks listed below - email the plot file to us. As usual, we like to thank those who contribute content to the site so if the best contribution comes from a visitor we have a full membership to give away, or if it comes from an existing member we'll give them a 12 month renewal. 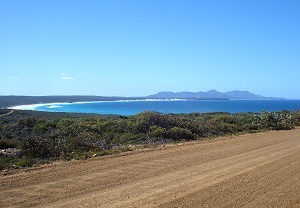 Email your plot files to: info@exploroz.com. *Plot files have to be recorded in good resolution and has to closely resemble the trek note route. Stock up on Explore Australia titles. Be quick!